For this month's newsletter, I have reproduced an article that was recently featured on the Procurious website as part of their Women in Procurement campaign. The original article can be found here. Diversity in our workplaces is important. It�s widely acknowledged that diversity in our leadership teams matters. It�s imperative for any organisation that wants to achieve and remain competitive. Diversity helps to generate new ideas, drive creativity, and meet market needs; it also reflects our own communities. While the benefits are many and varied I want to draw your attention to a recent body of research �Diversity Matters� conducted by McKinsey & Company. A new mindset and approach to diversity needs to occur. The overall current characterisation and management of diversity is too broad, it commands greater depth. In other words, a more individualised, tailored approach is required, it needs to be �unbundled�. The challenge of inclusion is not in producing a diverse workplace; diversity is rather the natural outcome of inclusion. If we define diversity as all the ways we are different � that which is the human condition, then inclusion is our ability to value, recognise and appreciate these differences. We see �in� and �out� groups start to form and those in the �out� groups (typically those people who find themselves in a demographic minority) less likely to stay in their roles. Attraction and retention are equally important partners in any organisation�s D&I journey; they must therefore be given equal effort and intent. If we focus back on our gender example, inclusion on a basic level means making women feel welcome and valued in the workplace. This can be reflected in policies such as: flexible work arrangements for men and women, allowance for career breaks, available role models, mentoring opportunities, and affinity groups. Leaders must step up to the challenge and in many cases push past the latent philosophy of maintaining status quo � the �why change something if it is not broken� attitude we all too often still see represented in the homogenous recruitment policies of organisations. As the authors of �Diversity Matters� point out we �must do more to take full advantage of the opportunity that diverse leadership teams represent� we live in a global world that has become deeply interconnected.� This research serves as an ongoing reminder of the headway that we have made to date in countries such as the U.S and U.K in diversity. But it also highlights the benefits to be gained and that there is still much work to be done. Newsletter Reader Question: I am currently exploring options to give up my �day job� and become a full-time, self-employed consultant in my particular field. What key skills should I be focused on if I go ahead and take this leap? Giving up a day job and becoming a consultant is certainly a big change. Some people choose to do so due to lifestyle choices, whereas others find themselves thrown into it. Regardless, it goes without saying that you need to be good at what you do. Of course there is always room for self-improvement, but people don�t become consultants without the necessary technical skills that are sought after in their particular field. Apart from the technical skills, I think developing a strong sales and marketing skillset is invaluable to ensuring your long-term success as a consultant. Getting the gigs to actually do the job is the biggest stumbling block for new consultants starting out. It is quite common to have a former professional contact as a first client; in fact this client may have acted as the initial impetus to becoming a consultant. However, acquisition of client two, three, four, etc. will require you to put on your sales and marketing hat. Networking and building referrals are the two areas of sales and marketing that you can�t allocate too much time to. Many consultants fail to do these activities, especially when they are busy, and this can lead to a feast/famine model of business. Maintaining consistent sales and marketing activities helps you to build momentum and attract new business. Your reputation as a consultant provides marketing �gravity� that also helps you to build and sustain longevity. The recommended reading for this month will help you generate some ideas on how to do this. Finally � be passionate about what you do. Energy is infectious and it is vitally important to be able to articulate how you can add value to your clients. As the Consultants� Consultant, Dr Alan Weiss says, "Our role is to improve the client�s condition." Five years ago, Diane Mulcahy created and began teaching an MBA class on �The Gig Economy� at Babson College. The class gained tremendous traction right from the get-go and was subsequently named by Forbes as one of the Top 10 Most Innovative Business School Classes in the US. In response to recessions and layoffs, the gig economy is booming around the world. As the more traditional corporate jobs continue to become increasingly unstable and increasingly scarce, more and more people are turning to short-terms jobs, contract work and freelance assignments for opportunities. 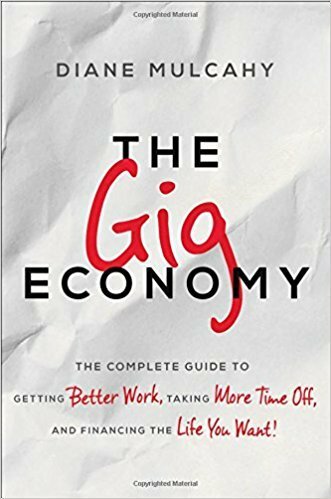 In her book - The Gig Economy, Diane Mulcahy presents a guide to the uncertain but ultimately rewarding world of finding your own gig. She supplies powerful strategies, packed with research, exercises and anecdotes, to help you take control of your future and create your own career trajectory. From networking and financial security to taking time off and reducing risk, Mulcahy skilfully outlines a path to follow so as to build a life based on your priorities and vision of success.